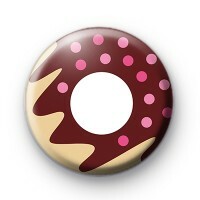 This badge is of a classic donut with chocolate frosting and pink sprinkles. Its making me crave a sweet treat just looking at it. What is your favourite doughnut? I like a simple Ice glazed, delicious. All our badges are 25mm in size and handmade in the UK.